Wagjag has a nice deal on this KitchenAid Cookware Set! 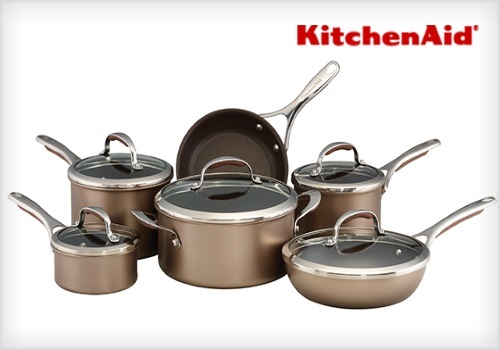 Get an 11-piece KitchenAid Hard Anodized Non-stick cookware set for $149.99 ($699 value). Set Includes: 1, 2 and 3 qt saucepans with lids, 5 qt dutch oven, 9.5” skillet with lid and 8.5” skillet. Product will arrive within 2-4 weeks of deal closing date (March 21). Limit 6 buys per person, may buy more as gifts. $10 shipping charge added on at checkout. Limited quantities are available!